The colors in all your photos are spectacular, it’s like looking at a well exposed Kodachrome slide, and the image today is no exception! I wish that I could come close to the colors that you’re able to capture. Nice shot! No words needed . Is that a caterpillar on the bottom right leaf? Thanks. It’s not a caterpillar but a flower from some kind of weed. Just the same so much to look at in that photo. And still that yellow flower is the focus once zoomed in .Fantastic composition . Thank you John! Do you see many spider webs in your region? Thank you Mohammad. Glad you like this photo! That is a very cool image. 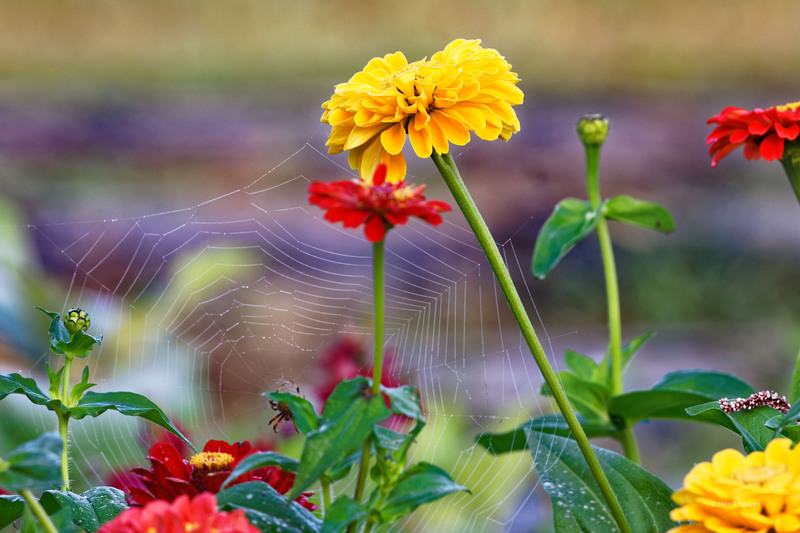 The colors of the flowers, the hints of lavender in the background and the geometry of the spider web really do combine to make something remarkable and pretty. Arachnophobe that I am, I do love the webs. Thank you very much Judy! It’s a great comment coming from you! I love the almost concealed spider and tiny caterpillar on the right. There is much going on in this captured scene! You are right, many elements in this scene by nature! Thank you for commenting. Beautiful! Lovely colors and an amazing cobweb!